Review Summary: Ranbir Kapoor is brilliant. But 'Sanju' does not take chances. A good film but Hirani's weakest. Let's get one thing straight: This is a work of fiction masquerading as a biopic. And Rajkumar Hirani may have violins standing by to manipulate emotions, and he has Ranbir Kapoor mimicking Sanjay Dutt's mannerisms, but the movie remains a vanilla version of a life full of violence induced by drugs, guns, bad company and women. I’m going with three-and-a-half out of five for Sanju. It’s a consistently engaging film that makes its way to your heart even though the head frequently resists. Ranbir Kapoor's Sanjay Dutt biopic is an emotional roller coaster that plays out like a bestseller! And for his friend Sanjay Dutt, he has given a vehicle to finally tell his version of events and say to his detractors -- bas ho gaya yaar! This is, in fact, a calculatedly cauterised version of Sanjay Dutt’s life presented in a vividly engaging manner, but without the grit and rigour of real life. Yes, there’s a lot missing, but even then, this is still an incredible story of a man and a movie star who made massive mistakes, walked through fire, survived it and lived one heck of a life. 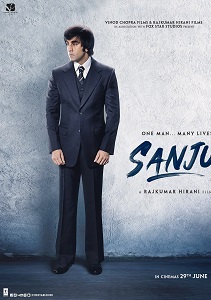 “Sanju” is not a particularly engaging film because it stretches too long and resorts to melodrama over substance, but Bollywood also lost the opportunity to look at one of its own with a neutral lens and tell his story honestly. Ultimately, the film is not as much about the flaws in the hero as about him being wronged by the media which is yet a convenient villain. Ranbir Kapoor Gets A Pool To Reflect In & He Grows To Conquer! A Joyride Which Will Leave You High On Emotions!